In 2017 a widely promoted island music festival in the Bahamas collapsed, leaving a raft of rich young dilettantes and social media influencers trapped in a post-apocalyptic mess of soaked-through tents, inedible catering, missing transport, and broken promises. The Fyre Festival, launched by musician Ja Rule but ostensibly organised by entrepreneur Billy McFarland, was a remarkable opportunity for Internet-based observers to enjoy a little schadenfreude. In fact the collapse of the festival, when presented in documentary form, is much less amusing to observe. It left behind not just broken dreams and upset customers but humiliation, job losses, and criminal charges against McFarland for a grand-scale act of fraud. Both Netflix and Hulu have launched documentaries exploring the actions by and repercussions for the Fyre Festival staff, as their widely hyped island adventure turns out to be a catastrophic nightmare for almost all concerned. 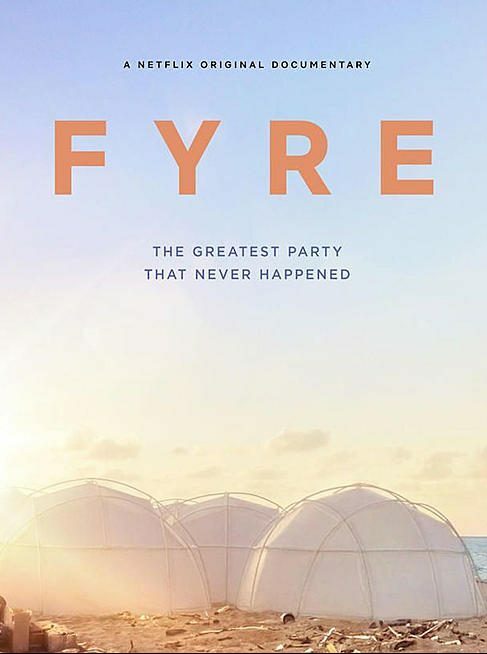 Fyre: The Greatest Party That Never Happened, the Netflix take on the subject, comes from director Chris Smith. What one might expect to be a bleakly funny indictment of rich kid stupidity turns out to be simply rather bleak. Things begin simply enough, with a small business venture in giving millennials their own exclusive credit card and social club combination. That such a plan spontaneously expands to an similarly exclusive music festival on an isolated tropical island is immediately concerning. It is clear from the outset that its organisers are unprepared and likely incapable of putting the festival together, and the documentary shows an increasingly downhill trail from that point. It is rapidly clear that everyone is in over their head. It is also clear that no one wants to look gullible, or stupid, or grossly incompetent. The bulk of Fyre is a series of talking heads, each going out of their way to save face while simultaneously – and, one assumes, unintentionally – incriminating themselves for dubious behaviour and suspect business practice. The one professional among the bunch is clearly Ja Rule, who tellingly vanishes from the documentary the second things begin to turn south. If he is further to blame than his initial pitches, there is no sign of it on screen. What begins as a large-scale act of incompetence soon segues into something much more dubious, as McFarland’s attempts to transform failure into success shift from the borderline criminal to the actively fraudulent. At the documentary’s beginning he comes across as an overconfident idiot, but by halfway through he seems a far more untrustworthy character – a trajectory that only accelerates as the Fyre Festival collapses. At the time, imagery of rich twenty-somethings turning up to a desolate campsite more akin to a nuclear disaster area than a rock concert was cause for mean-spirited amusement. Actually seeing and hearing the experience up close is genuinely sad. At one particular stage it sounds actively frightening. The film winds up as a profile of Billy McFarland: an unrepentant con artist and fraud, who is on bail for one crime while openly engaging in another. The over-confidence is staggering. While Chris Smith does his best to lay the events out methodically, it is unlikely that his audience will ever really know who precisely was at fault alongside McFarland. It’s impossible to tell who was maliciously criminal and who was embarrassingly incompetent. Some of the things individuals admit to doing are truly staggering. In the end, Fyre is less of an engaging documentary about people doing terrible things, and more of a forensic dissection of a crime scene. It engrosses and fascinates, but never quite engages on an emotional level. Hulu’s own documentary Fyre Fraud is available for anybody seeking a different take. Netflix’s effort is smart, methodical, but just a little cold.